Free Printable Mary Mary Quite Contrary. 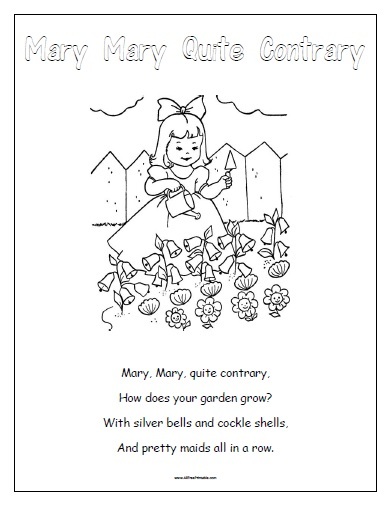 Free Printable Mary Mary Quite Contrary Nursery Rhyme to sing and color the page. You can use the printable Mary Mary Quite Contrary nursery rhyme for preschool, daycare, kindergarten or home. Print the Mary Mary Quite Contrary using your inkjet or laser printer and share with the little kids. They can sing the nursery rhyme together and have fun coloring the letters in the title “Mary Mary Quite Contrary” and Mary too. Download the Mary Mary Quite Contrary free. Let’s all sing Mary, Mary, quite contrary, How does your garden grow? Instructions: Click the print link to open a new window in your browser with the PDF file, then print or download using your browser’s menu.